Millions of people will buy VR headsets in the coming years to play games and view 3D content, and those sales could spark a real-world war among chip-makers. Some new VR headsets announced at this week's Game Developers Conference in San Francisco are full-on computers, and others need to be hooked up to PCs with powerful graphics cards, similar to Oculus Rift. The VR devices, designed for gaming and for roaming 3D worlds, are a showcase for the graphics technologies of chip makers like AMD and Qualcomm. The headsets set up a battle in the fast-growing VR space among chip makers, which also include Intel and Nvidia. The war among chip makers comes with a twist because it places a large on emphasis on GPUs, which are important for rendering 4K video and 3D content. The Sulon Q headset, announced this week, is a full computer in a headset for VR and augmented reality, and it runs on AMD's chips code-named Carrizo. The headset is similar to Microsoft's HoloLens, and it allows users to interact with 3D objects that show up as floating images, much like holographic projections. It has a 2560 x 1440 OLED display and a graphics processor that can run high-end games. But with PC components crammed into the headset, questions remain about whether it will heat up and be uncomfortable to wear. The Carrizo chips include a lighter version of the high-powered Radeon GPUs used in desktops linked to Oculus Rift VR headsets. AMD believes VR headsets will need powerful on-board graphics processors for life-like images and high frame rates, or else the experience could get nauseating. By comparison, Microsoft's HoloLens, which will ship soon, has a low-power Intel processor code-named Cherry Trail, designed for tablets. The GPU in Cherry Trail isn't as powerful as the AMD GPU in Sulon Q, but provides the HoloLens with a longer battery life. The HoloLens is focused more on blending real and virtual worlds than on high-end gaming. Qualcomm's latest Snapdragon 820 chip -- which is in smartphones like Samsung's latest Galaxy S7 -- is also coming to VR headsets. 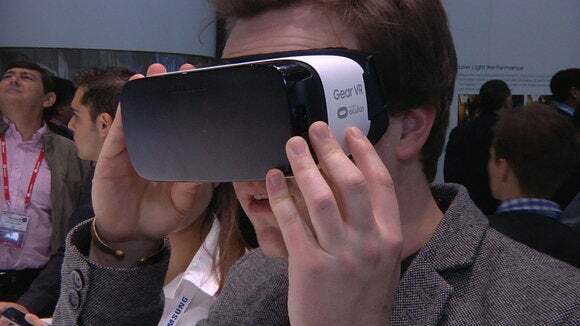 A headset from China-based Goertek is among the first with a Snapdragron 820 chip, which is capable of rendering 4K video and 360-degree interactive video. "Several other VR devices that use Snapdragon 820 will be announced later this year," Tim Leland, vice president for product management at Qualcomm, said in an email. Right now, most of the VR headset chips are adapted from those found in mobile devices or PCs. But if VR headset shipments hit tens of millions of units, Intel, AMD and Qualcomm may develop specialized chips, said Nathan Brookwood, principal analyst at Insight 64. Making chips can be expensive, and the economics have to make sense, Brookwood said. But the rise of VR reinforces the importance of visual computing and graphics processors, Brookwood said. Gartner is projecting VR headset shipments to reach 1.4 million this year, growing from 140,000 in 2015. Shipments will grow to 6.3 million by 2017, the company predicts.